July 1st 2017 marks the 150th anniversary of the unification of Quebec, Nova Scotia, New Brunswick and Ontario to form the Dominion of Canada. We have colouring pages, card, bunting and more to help you mark the event. Why not colour 150 of our candles to make a wonderful group display, we'd love to see pictures if you do! Share the celebration with this Canada 150 printable card. Perhaps your Brownie or Scout pack could send one out to other packs in Canada or around the world? This simple Canada 150 doodle page has outline numbers for 150 for your children to get busy colouring and decorating with symbols of Canada. We've added a flag to start you off. Record your memories of the 150th anniversary of the founding of Canada with this fun Canada 150 frame. We have lined or blank versions for you to choose from. This bright simple Canada 150 poster is in the Canadian colours of red and white, perfect to display for the celebrations or to use as a scrapbook cover. As the kids fill in the missing words in this Canada Day cloze, they will be learning a little about Canada Day and its traditions. Every celebration is better with cake. This printable ask children to decorate a cake for Canada 150. What colours will they use? What decorations will they draw? There are two design a logo worksheets to choose, one for younger children and one for older. Each asks children to research the logo chosen for Canada 150 and then design their own. Historic events are often commemorated by stamps. Can your children design a stamp for Canada 150? Will they chose to include a place, an activity or a symbol. Encourage them think about what Canada means to them. This Happy Birthday Canada card would make a perfect invitation to a Canada 150 celebration. Invite a special person to a celebration event or send this card to a partner school or Brownie pack to mark the occasion. There is a very scrumptious looking birthday cake on this Happy 150th Birthday Canada Colouring Page. Help people find your celebrations with this fun and colourful Happy 150th Birthday Canada Poster. More Activities for Canada Day! 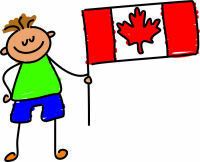 Enjoy our general collection of Canada Day printables, colouring pages, crafts, puzzles and worksheets.